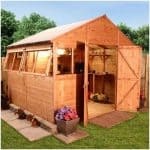 This is a large and yet beautiful shed that would grace any large and beautiful garden. The look is classically traditional, and yet it is smooth and refined rather than being rough and rustic in appearance. That’s because of the tongue and groove cladding used for the walls, which bring excellent weather proofing properties as well as creating a beautiful interlocked texture. The pent roof is well constructed from high quality material, and indeed quality is a feature that runs throughout this garden building. The roof’s natural slope ensures that water simply runs off, rather than being allowed to remain on the surface where it could eventually compromise the integrity of the roofing felt. 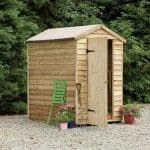 With so much space available within this shed, it can be used to store much more than garden tools, or can be used as an auxiliary space for you to relax in or take part in a hobby. Because of it’s size, however, it can attract unwanted attention, so security is of the utmost importance. That’s why we were pleased to see how substantial the shed is, and the padlock protector is another useful touch, although it would have been nice if a padlock had been included as standard. We were impressed by this shed on first sight; it’s not just the dimensions of it, although these themselves are impressive, but the overall aesthetic appeal. The walls are beautifully smooth, and the pent roof really gives it a classic finish. The slope on the roof isn’t too obtrusive, but is more than enough to ensure that rain or snow slides away rather than collecting on the surface. 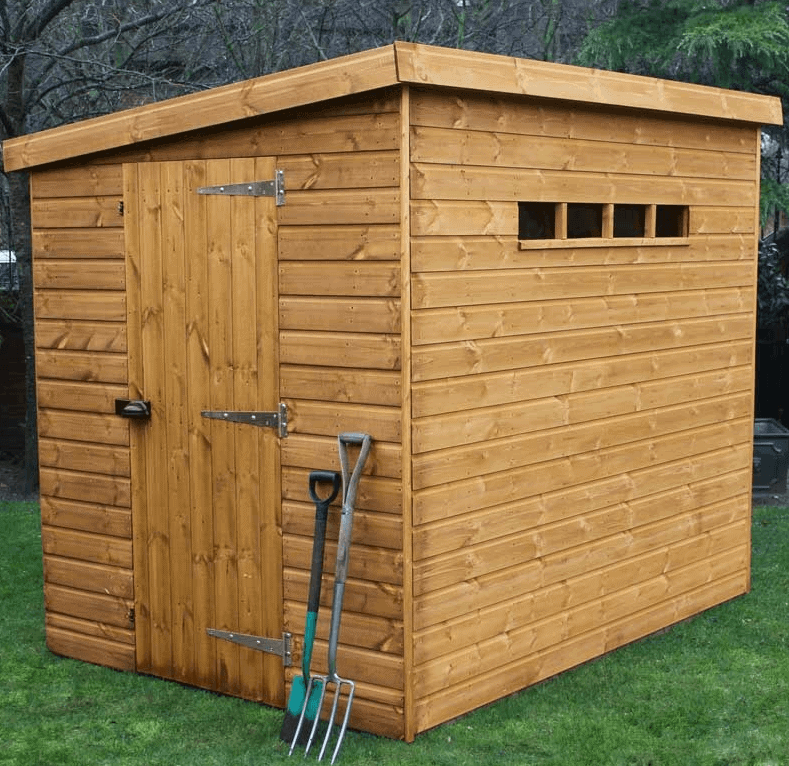 Designed as a security shed, it has a range of features that add to the safety of the contents inside, such as the small windows beneath the roof line. At its maximum point the roof is exactly two metres high, and the eaves height is 1.75m. The door height is also a generous 1.75m tall, and an accommodating 0.76m in width. Other dimensions to note are the shed’s width of 2.44m (taken on the door side) and a depth of 3.05m. When we review a shed that is at the higher end of the price range, such as this one, we like to ensure that the cladding is of the highest quality. Thankfully, that’s just what we found with this security shed. The tongue and groove has been perfectly machined, so the pieces interlock freely and tightly keeping rainwater out. You can feel the solidity of the shed as a whole, and in part this is because of the 12mm thickness of the cladding, as well as the chamfered close edge framing. It’s another quality touch that adds extra strength where it’s needed most. We were pleased to see that the floor too was made of the same Redwood tongue and groove cladding. Not only does this stop moisture rising up and getting into the shed itself, it feels solid under the feet and will have a good load bearing capacity. One thing we would have liked to see with this shed would have been a more thorough pre-delivery preservative treatment. An initial basecoat has been applied by the manufacturer but in essence this is there to protect the substrate during the transportation process. 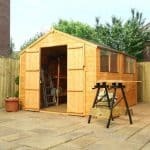 A one year warranty is provided, but this is dependent upon the shed owner using a good quality preservative six weeks after they install the shed, and at yearly intervals after that date. For this reason, the manufacturer also warns that a one foot area should be left free around the shed to allow ease of retreatment as well as promoting a good air flow, thus reducing condensation build up. We found the door reassuringly strong in our hands, and this is because of the security bolted hinges. It’s also tall enough to ensure that you don’t have to stoop down when walking through it, and wider than the average shed door so bringing equipment in and out is easy. One of the most striking features of this shed is the series of four small windows adjacent to each other on the taller side of the shed. These allow adequate light into the shed, but because of their positioning and dimensions they make it hard for passers by to see inside. This is such a large and well built shed that it could attract interest from unwanted sources, so security is all important. The overall toughness of the construction will certainly serve as a first line of defence, and the padlock shield is a welcome feature. We were disappointed however that a padlock wasn’t included, and also that the windows were made of horticultural glass rather than a tougher form of glazing. Their size and positioning however do make them an unlikely access point. Whilst a padlock isn’t available as an optional extra, we strongly advise investing in one. 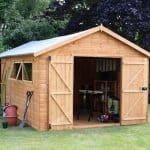 One important extra that is available, however, is a set of wooden floor bearers designed to match the dimensions of this shed. These are very important because they elevate the shed’s base above ground level. By doing this, the threat of rot caused by moisture in the ground is reduced and the shed as a whole will feel noticeably drier and warmer. Despite its size, we found the installation of the shed to be relatively straight forward when following the simple instructions. 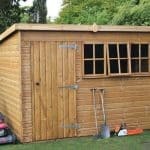 We appreciate, however, that some people simply don’t have the time or desire to piece together a tongue and groove shed, so for them the optional installation service is ideal. 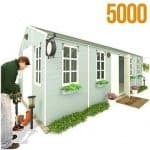 For just £109, the customer can relax with the peace of mind that their new shed will be perfectly constructed. Further customisation can be achieved via an option which allows the customer to decide which gable end the door is situated at, which means that the shed can be adapted to suit the shape, size and layout of their own garden. The high quality of this shed is evident upon first sight, and this initial positive reaction was confirmed when we took a closer look at the components themselves. The quality and strength of material, made from environmentally friendly Redwood, will help to ensure its longevity, but this would have been greatly aided by a pressure treatment before delivery. A large internal volume is aided by the large single door, which makes it easy to transport goods in and out. Two of us managed to put this shed together in around five hours, and we were pleased to see that all the parts fitted together perfectly without having to use force. The optional installation service is a good addition for those who feel daunted by the prospect of erecting a shed of this size. Whilst the quality and size of this shed are both excellent, the price remains towards the top end of the scale, especially when the cost of annual treatment is added on. Nevertheless, you get what you pay for, and this is a very high quality security shed. 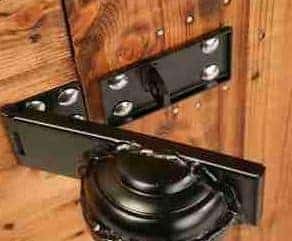 Final Thoughts: If you are looking for a large secure area to store your garden goods, and maybe even machinery, inside then with the addition of a padlock this could be a very good, if not inexpensive, choice. The tongue and groove design is excellent at preventing the ingress of rainwater, but remember that it needs to be preserved after six weeks and then on an annual basis. As the timber is provided in an unpainted state, you may also wish to paint or stain it, so ensure that the wood stain you buy is suitable for smooth, high quality timber. We loved the look of this shed, with the four mini-windows a stand out feature, and it should complement any medium to large garden.